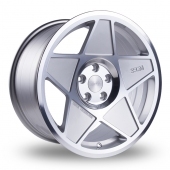 Shop for 3SDM Alloys & Wheels - Buy 3SDM Alloys from Wheel Base the UK's leading Alloy Wheels website. 3SDM was formed in early 2011 by a group of open-minded modified car guys who wanted to inject some fresh life into a somewhat stale scene. 3SDM decided to do something about it and give the modified car scene exactly what it needed. We offer a wide selection of Alloy wheels. Click here to view all alloy wheels. Or use our Easy Wheel & Tyre finder above. Looking for a set of new 3SDM 0.05 Silver Polished alloy wheels and tyres? Our 3SDM 0.05 Wheel and Tyre packages are designed to save you money and time. What could be simpler than buying a complete set of 3SDM 0.05 wheels and - no need to get your tyres fitted at a local garage. We have a wide selection of tyre brands, ranging from our economy tyres if you are on a budget to our premium tyres including Pirelli, Continental, Dunlop, Michelin and Bridgestone. Simply select your car make and model then choose the best wheel for your budget. All packages include 4 alloy wheels, 4 tyres and a free fitting kit. They are fully fitted and balanced to the highest standards. Every order is fitment checked and supplied with the correct fitting kit. When you receive your package, all you need to do is fix them to your vehicle with the fitting kit supplied. If a 5th wheel and tyre is required for a spare, please call our sales team on 0800 130 3400, they will be happy to help. All Tyres professionally fitted to the Alloy Wheels. All Alloy Wheels & Tyres are professionally inflated to the correct pressure. All Wheels & Tyres are fully balanced with the latest balancing equipment. All Wheels & Tyres are balanced with top quality Trax weights. All Wheels & Tyres are packaged to the highest standards. All Alloy Wheels & Tyres are fully insured during shipping.